American engineer mission specialist astronaut 1978-1985. Status: Inactive; Active 1978-1985. Born: 1939-01-28. Spaceflights: 2 . Total time in space: 13.17 days. Birth Place: Goosecreek, Texas. Educated Washington State; AFIT; Washington. PERSONAL DATA: Born January 28, 1939, in Goosecreek, Texas, but considers Pullman, Washington, to be his hometown. Married to the former, Donna Kay Buboltz of Spokane, Washington. They have two grown children. Recreational interests include skiing, stamp collecting, and jogging. EDUCATION: Graduated from Pullman High School, Pullman, Washington, in 1957; received a bachelor of science degree in Mechanical Engineering from Washington State University in 1962; a master of science in Aerospace Engineering from the Air Force Institute of Technology in 1964; and a doctorate in Aeronautics and Astronautics from the University of Washington in 1974. ORGANIZATIONS: Associate Fellow, American Institute of Aeronautics and Astronautics; Fellow, American Astronautical Society; President, Association of Space Explorers; Corresponding Member, International Academy of Astronautics. SPECIAL HONORS: Air Force Astronaut Wings; NASA Space Flight Medal with one Oak Leaf Cluster; Federation Aeronautique Internationale - Komarov Diploma; Air Force Meritorious Service Medal; Defense Superior Service Medal Legion of Merit, Defense Meritorious Service Medal, French Legion of Honor, Saudi Arabian King Abdul Aziz Medal; Air Medal with 2 Oak Leaf Clusters; Air Force Commendation Medal; Washington State University Sloan Engineering Award (1961); Air Training Command Academic Training Award (1966); Squadron Officer School Commandant's Trophy (1968); Squadron Officer School Chief of Staff Award (1968); Washington State University Distinguished Alumnus Award (1983); Washington State Service to Humanity Award (1983); Distinguished Alumnus Award (1985); Medallion of Merit (1987); Phi Sigma Kappa. EXPERIENCE: Fabian, an Air Force ROTC student at Washington State University, was commissioned upon graduation in 1962. After an assignment at the Air Force Institute of Technology at Wright-Patterson Air Force Base, Ohio, he was assigned as an aeronautics engineer in the service engineering division, San Antonio Air Material Area, Kelly Air Force Base, Texas. He then attended flight training at Williams Air Force Base, Arizona, and subsequently spent 5 years as a KC-135 pilot at Wurtsmith Air Force Base, Michigan. He saw action in Southeast Asia, flying 90 combat missions. Following additional graduate work at the University of Washington, he served 4 years on the faculty of the Aeronautics Department at the USAF Academy in Colorado. He has logged 4,000 hours flying time, including 3,400 hours in jet aircraft. NASA EXPERIENCE: Selected as an astronaut candidate by NASA in January 1978, and became an astronaut in August 1979. During the following years, he worked extensively on satellite deployment and retrieval activities, including development of the Canadian Remote Manipulator System. A veteran of two space flights, he has logged over 316 hours in space. 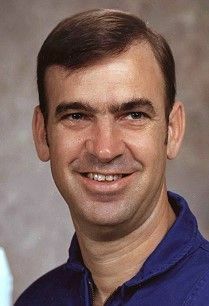 He served as a mission specialist on STS-7 (June 18-24, 1983) and STS-51G (June 17-24, 1985). He was scheduled to fly next in May 1986 on STS-61G. This flight was one of several deferred by NASA in the wake of the Challenger accident . Fabian left NASA on January 1, 1986 to become Director of Space, Deputy Chief of Staff, Plans and Operations, Headquarters USAF. Colonel Fabian retired from the USAF in June 1987 and joined Analytic Services Inc (ANSER), a non-profit aerospace professional services firm in Arlington, Virginia, where he is now President and Chief Executive Officer. SPACE FLIGHT EXPERIENCE: Fabian first flew as a mission specialist on STS-7, which launched from Kennedy Space Center, Florida, on June 18, 1983. This was the second flight for the Orbiter Challenger and for the first mission with a 5-person crew. During the mission, the crew deployed satellites for Canada (ANIK C-2) and Indonesia (PALAPA B-1); operated the Canadian-built Remote Manipulator System (RMS) to perform the first deployment and retrieval exercise with the Shuttle Pallet Satellite (SPAS-01); conducted the first formation flying of the Orbiter with a free-flying satellite (SPAS-01); carried and operated the first U.S./German cooperative materials science payload (OSTA-2): and operated the Continuous Flow Electrophoresis System (CFES) and the Monodisperse Latex Reactor (MLR) experiments, in addition to activating seven Getaway Specials, Mission duration was 147 hours before landing at Edwards Air Force Base, California, on June 24, 1983. On his second mission, Fabian flew on STS 51-G which launched from the Kennedy Space Center, Florida, on June 17, 1985, and landed at Edwards Air Force Base, California, on June 24, 1985, after completing approximately 170 hours of space flight. This international crew deployed communications satellites for Mexico (Morelos), the Arab League (Arabsat), and the United Stated (AT&T Telstar). They used the Remote Manipulator System (RMS) to deploy and later retrieve the SPARTAN satellite which performed 17 hours of x-ray astronomy experiments while separated from the Space Shuttle. In addition, the crew activated the Automated Directional Solidification Furnace (ADSF), six Getaway Specials, participated in biomedical experiments, and conducted a laser tracking experiment as part of the Strategic Defense Initiative. BIRTHPLACE AND DATE: Fabian was born on January 28, 1939 in Goosecreek, Texas. EDUCATION: Bachelor of Science degree in mechanical engineering from Washington State University in 1962. Master of Science degree in aerospace engineering from the United States Air Force Institute of Technology in 1964. Doctorate in astronautics and aeronautics from the University of Washington in 1974. EXPERIENCE: An Air Force officer from 1962, Fabian was a fighter pilot in the Vietnam War. He logged over 4,000 hours of flight time. Fabian was selected in 1978 as a NASA astronaut in the first space shuttle astronaut group. He completed astronaut training in 1979,. Qualified as a mission specialist, Fabian worked on satellite deployment and retrieval techniques and equipment, including development of the Shuttle's Remote Manipulator System robot arm. In 1986 Fabian left NASA to become Director of Space at U.S. Air Force Headquarters. He retired from the Air Force in 1987 to become President and Chief Executive Officer at ANSER (Analytic Services, Inc.), a nonprofit aerospace professional services organization in Arlington, Virginia. Family: Astronaut. Country: USA. Flights: STS-7, STS-51-AA, STS-51-G. Projects: STS. Agency: USAF. Bibliography: 5364. 1939 January 28 - . Birth of John McCreary Fabian - . Nation: USA. Related Persons: Fabian. American engineer mission specialist astronaut 1978-1985. 2 spaceflights, 13.2 days in space. Flew to orbit on STS-7 (1983), STS-51G..
STS-7 - . Call Sign: Challenger. Crew: Crippen, Fabian, Hauck, Ride, Thagard. Payload: Challenger F02 / OSTA-2. Mass: 16,839 kg (37,123 lb). Nation: USA. Related Persons: Crippen, Fabian, Hauck, Ride, Thagard. Agency: NASA Houston. Program: STS. Class: Manned. Type: Manned spaceplane. Flight: STS-7. Spacecraft Bus: Shuttle. Spacecraft: Challenger. Duration: 6.10 days. Decay Date: 1983-06-24 . USAF Sat Cat: 14132 . COSPAR: 1983-059A. Apogee: 307 km (190 mi). Perigee: 299 km (185 mi). Inclination: 28.30 deg. Period: 90.60 min. Manned five crew. Deployed Anik C2, Palapa B1; deployed and retrieved SPAS platform. Payloads: Office of Space and Terrestrial Applications (OSTA)-2 experiments, deployment of PALAPA-B1 communications satellite for Indonesia with Payload Assist Module (PAM)-D and Telesat-F communications satellite for Canada with PAM-D, German Shuttle Pallet Satellite (SPAS)-01, seven getaway specials (GAS), Monodisperse Latex Reactor (MLR), Continuous Flow Electrophoresis System (CFES). 1983 June 24 - . Landing of STS-7 - . Return Crew: Crippen, Fabian, Hauck, Ride, Thagard. Nation: USA. Related Persons: Crippen, Fabian, Hauck, Ride, Thagard. Program: STS. Flight: STS-7. STS-7 landed at 13:56 GMT. .